Our promise has always been to provide the very best care for all who come to us for help. With your support of Promise: The Campaign for Texas Children's Hospital, we have expanded our care to meet our patients’ most critical needs. The Lester and Sue Smith Legacy Tower was created as the hospital's new home for heart and intensive care and surgery. One of our most important advantages for engaging our world-class physicians and scientists is our ability to offer endowed chairs. Texas Children's has served more and more children and families who have limited resources and little or no insurance coverage but who desperately need the specialized care we can provide. This 584,000-square-foot, state-of-the-art facility, completed May 2017, is the first and only dedicated pediatric hospital serving the communities north of Houston. Texas Children’s offers complex treatments in the nation’s finest specialty and subspecialty divisions from the world-class neurology and cardiology departments to the largest pediatric cancer and blood disease center in the U.S.
Meet the faces and families whose lives have been directly affected by our promises and your generous support. 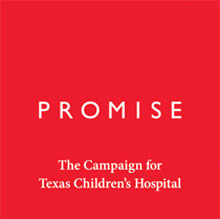 To learn more about Promise: The Campaign for Texas Children's Hospital download the full Impact Report.